Much like your wardrobe, your skin often needs a refresh – out with the old and in with the new! 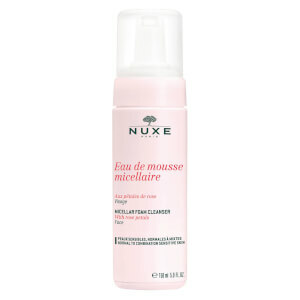 So the Nuxe Gelée Exfoliante Douce – Gentle Exfoliating Gel is the perfect way to eliminate dead skin cells and old make-up to make way for a fresh new complexion. For best results deep cleanse your face and hold it over steaming water to open your pores then use a light exfoliating circular motion over the skin so the formulation can gently remove impurities. Lovely rose scented gel exfoliating gel, very gentle with no harsh plastic beads that so many exfoliators contain these days. This exfoliator leaves your face feeling smooth and soft without any dryness, gentle enough for daily use, slightly lathes up when you rinse it off. Whilst not a huge tube only a very small amountis needed so it should last for ages. I highly recommend this product, its one of yhe best exfoliators I've used I for one will be ourchasing it again. Fantastic product, leaves skin smooth and clean, very gentle and easy to use on wet or dry skin. I tried many exfoliating gels and creams for my sensitive skin, and this Nuxe Gelee Exfoliante Douce - Gentle Exfoliating Gel is the best I found.